I always see neat, "What's In My Bag" pictures, so I thought I would do my own. I've had this Betsey Johnson purse for quite sometime, and it never fails me. Usually I keep throwing stuff in it, and never look back. 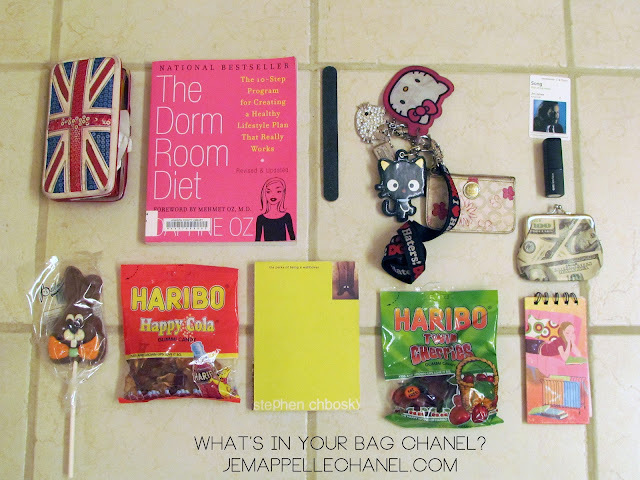 This was all the stuff in my purse today! I didn't add anything extra to make me look cooler, I probably should have because I look like a candy obsessed nerd, but this is what I had. It is so important for me to always carry books. I'd rather be the girl who is reading a book while waiting for something than the one who is engrossed into her phone. All of the candy were gifts from my best friends parents for Easter. !